These are 22mm light infantry and really at £4.06 for 24 figures are only half the usual box size of figures from HAT. ______ This does make their 28mm figures a better choice for my money.
. " An BB can see them." They are blue on P S R, but they could be whatever colour they wish to produce them in. Last edited by Kekso on 18 Sep 2018, 10:10, edited 1 time in total. The nco in the French staff set has a curiously small musket. Something went wrong there I guess. The policy of half sets is stupid. Why oh why!? My problem, echoed by friends is that these figures are ridiculously small. When compared to Hats own light infantry the difference is obvious with the shoulder height being much lower. A colleague ordered eighteen sets which are now of no use. I have six sets which I will hopefully sell onto an admirer of smaller figures. They were destined to be part of Bonaparte's Division at Quatre Bras but unfortunately I will now be looking elsewhere. I personally can not understand why the system international for measurements is so open to 'interpretation' by manufacturers. Waterloo 1815's otherwise excellent Prussian command is huge and also therefore useless. Italieri are also well known for their Giants and now Hat have gone to the other extreme. Really disappointed with these new Hat sets which I’ve been looking forward to for so long. The poses are not very good in the marching sets, all of them look like they’re taking long strides, with either the front leg or back leg really stretched out. Just compare them to the light infantry sets. Why didn’t they just use the same sculptor? I agree with the critics about size too, although I haven’t got them yet. Still I’m going to use them. They will form seperate blocks, apart from the firing lines. The fusiliers were for a big part kids at the time of Waterloo. The Strelets Guard at attention etc are also small, but still a bit bigger. Well, that’s according to PSR. As they were in reality. They can stand close to the fusiliers. Anyway: it’s wrong and another huge mistake. But another thing: it’s not likely anyone is going to produce new French line infantry in plastic.... I simply gòt to live with it! I can live with their small size which suits to the historical tallness. A greater problem are the prizes for new Haet sets with only the half of soldiers than the former sets. We customers have to pay more for paper and shipping and get less for it. The new Napoleonic french in greatcoats have still less figures, only 20 and still less details! This doesn´t make any sense. Fortunatly I have bought the new sets in UK with 4,50 GBP per set, but the first german-shop offer the sets now for incredible € 8.-! 20 or 24 figures for € 8,-! So I presume that only few customers will buy these figures and in consequence Haet will produce less new sets, which is really a pity. There were enough advices on Haet´s forum, that 24 marching soldiers in a set won´t find many buyers. And so it will come ... sadly! loose heads, sword arms, drums. Those swords need replacing that`s is for sure. All the sets come into the 22mm range. It appears that only the French are in half boxes or indeed third of a box sets and not others. I think the height is historically accurate for the time, what has happened over time is scale creep, with most of our 1/72 manufacturers , we have got used to 24mm + plus figures that are in reality too tall. I am all in favour of consistency though,sadly what we have is inconsistency from everyone. I ordered two of the greatcoat sets, but should have looked at PSR first to see size, this is really bad news...Guess they will look like dwarfs next to other sets not to mention cavalry..
I’m going to use the French fuseliers 1815 as the young Marie Louise infantry, the latest conscripts of Napoleon. Even the Pokalem hat is included so one in four can wear that. Paint all the uniforms quite different so they will have a young, motley, poor and rag-tag appearance. Which will reflect a bit the historic reality of a rather big part of the French army during the Waterloo campaign. Still not ideal, but gonna make the best out of it anyway. All a bit sad, really. I hope I don't read a certain relish in some of the criticism, above. HaT in disarray is not a great thing for the hobby. If HaT is truly in a decline, it actually doesn't leave much for me in terms of plastic figures. Strelets are still a bit so-so & I'm not at all interested in their recent ranges. So what's left? It's significant that I'm using almost exclusively metal figures for my current interest: ECW. Tumbling Dice figures, mostly, and a few Art Miniturin (not as nice as TD, BTW). PSR has them awaiting review, and has them perfect for height, so I feel for our hobby manufacturers, we shout about wanting them right ,ie accurate historically ,and when they deliver that we complain they are too small !. Although I have no need or real wish to start painting nappy French again, I have bought a few boxes, more out of sentiment than need.I suspect I will continue to do just that,because I fear for our scale in this hobby is we lose more manufacturers. Here is the problem in my opinion. I do like the idea of the Marie Louise's however. I personally am a strong supporter of Hat and wish them success. The re issues at last of the WW1Germans etc ate a good start. I am happy to carve up their lights when they are reissued to get the troops I need. Apologies. That should read ARE not ate. Stubby fingers in action. Looking at this picture my opinion is that I can live with it. There is a problem, but it is, well: small. 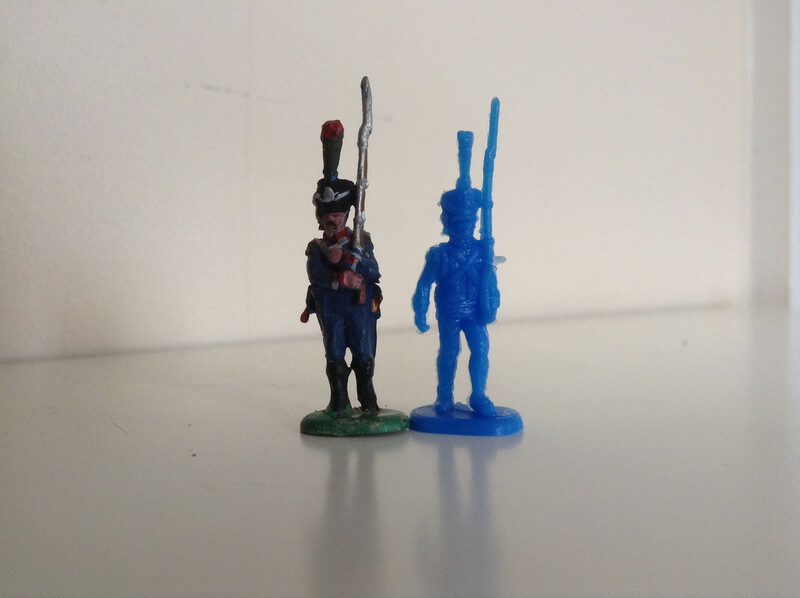 About another new set, the Hat Early/Mid French Marching: they are not that much smaller than the other old Hat set 1808-1812 French Line Infantry. 22,5 respectively 24 mm. Gonna use them both for Borodino (with the shako options they give us in the box!). Never had the intention to mix both sets on the battlefield on forehand, but to place them alongside of each other. My experience is that a block of one company, with their own size and other chararacteristics, can perfectly stand next to another block on the same battlefield. As long as they are no 2+ meter giants! 20 0r 24 toy soldiers for £8.00 on E BAY,has doubled the bad news really because I realise many members buy from there. It amounts to getting ripped off twice in my fair and free opinion. I think soldiers in former times were smaller than today. But if you watch actual soldiers on TV you can see that they are all different in heights and size. Some are small, some are tall, some skinny and some had a good breakfastlunchdinner over years. So you can mix them all. So combined a diorama can show the variety of mankind. Price is a whole different debate, but here is my six penny worth, Prices for Hat figures have remained unchanged more or less for ten years or so, cost have not. The market for 1/72 has shrunk over the last ten years or so, so manufacturers are selling a lot less and making a lot less profit, if that were not the case we would still have all those dormant companies still producing figures,but they are not. My view is they should increase prices to generate the extra revenue to make new sets, because unless they can show a profit why make it ?. We the end user need to recognize we are a niche market and not a mass market. Another example would be metal figures, we often pay 50p- 70p each for foot figures that usually are not as detailed and much cheaper to produce,yet paying less than 20p a figure for plastic is a rip off ? . I would happily pay more for a set if it is in scale. good quality and what I want, but we will never get more sets if we by our actions try to suppress the price so as to make producing toy soldiers unprofitable. marc zijp wrote: Looking at this picture my opinion is that I can live with it. Agreed, this is something I can live with as well. My thanks to Chris D for the comparison picture.